It’s day 8 of the Vodafone LiveGuy challenge and he’s walking the streets of Cardiff as I type. 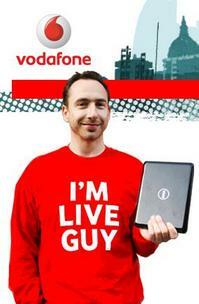 So if you’re a Cardiff resident, Vodafone LiveGuy could be somewhere near you today. It’s definitely worth having a scout about town – there could be a free Dell netbook in it for you and the self satisfaction of beating loads of other hopefuls to it. He’s already been spotted once today following some commentary on his blog about rugby. His next clue however isn’t easy. It involves his brain going clunk and the next location being “unexpected”. I have absolutely no idea what he’s talking about, but if the lights have just come on, what are you waiting for, go and nab yourself a netbook. And don’t forget the magic words “You’re LiveGuy and I’m a Vodafone winner”, otherwise you’ll be holding back the tears and walking away empty handed. Check out his blog here for more clues and his GPS location.